Relax at So SPA in Munich with its heated spiral shaped pool, steam bath, sauna and softly lit relaxing rooms built out of stone and beautiful tiles. Munich and Paris are united with invigorating massages and treatments using Cinq Mondes and Carita products. After a busy day in Munich, So SPA invites you to awaken your senses and feel re-energized – whether with a massage, a beauty treatment or a session in the sauna and steam bath. Explore a new kind of spa experience in Munich’s most luxurious hotel spa, with a wide menu of original treatments – and treats! – inspired by gastronomy. With the know-how of our experienced therapists, discover products and ingredients that enhance your nature. For more information please also have a look at our So SPA brochure. We are happy to welcome children under 12 years until 05:00 p.m. accompanied by a parent or guardian. After 05:00 p.m. the So SPA is closed for children for the purpose of relaxation and wellness. Please note that our So SPA area will be closed from 13 May – 16 May 2019 due to maintenance works. For your convenience we have arranged a cooperation with a 5* hotel across the street, where you may use the pool and recreation area. During this period, the facilities for beauty and massage treatments remain located at our hotel. Monday – Friday: 08:00 a.m. – 10:00 p.m.
Saturday: 09:00 a.m. – 10:00 p.m.
Sunday & public holidays: 09:00 a.m. – 09:00 p.m. In Munich’s So SPA by Sofitel you experience the Cinq Mondes spa philosophy: an exclusive blend of refined French cosmetology with inspiration from the world’s best health and beauty traditions. This combines with Carita, the prestigious Parisian skincare brand. Carita’s unique approach to beauty and anti-ageing treatments, including the exclusive Pro-Lift technology, offers a 21st-century vision of luxury French cosmetology. Work out in a state-of-the-art hotel gym in Munich, where fitness is taken seriously. Get to know your limits with a Cardio Pulmonary Exercise Testing (CPET) – challenge them with a personalized training program, developed by experienced fitness coaches. 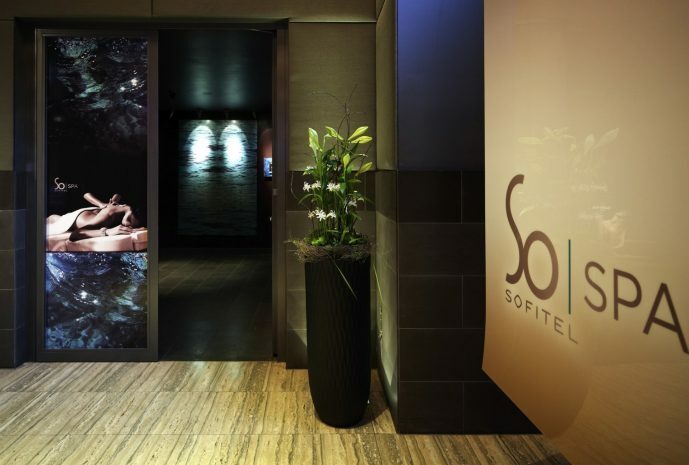 Treat your family or friends to a luxury spa experience in Munich for their birthday or anniversary, with an exclusive voucher for So SPA by Sofitel Munich Bayerpost. One of Munich’s best hotel spa is a remarkable 574 sq m (6178 sq ft) wellness area, located in the heart of the city. It offers numerous ways to recharge your batteries, whether working out in the state-of-the-art gym, taking a Cardio Pulmonary Exercise Testing (CPET), or indulging in an innovative massage or beauty treatment with products by Cinq Mondes and Carita. Call us to arrange a spa voucher for your family or friends. Sofitel Munich Bayerpost offers limited exclusive So SPA memberships to local residents and long-term visitors, not staying at the hotel. Subject to availability, you may choose a membership period of 1, 6, 12 or 24 months.